[Boston: Printed by B. Green, for S. Gerrish, 1724. , , 24, , 25, [1 blank], , 36 pp [as issued, except that this copy lacks a final blank]. The general title page is followed by three sermons, paginated individually but signed consecutively. Rubberstamp at upper blank portion of general title page, small release stamp at blank bottom margin of last page. Top margin trimmed closely, occasionally shaving small portion of running title. 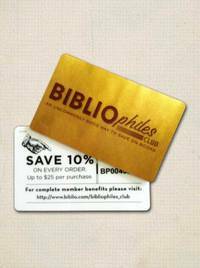 Light wear, disbound, Good+. A very scarce, early American imprint. NAIP, recording only five locations, corrects Evans's cataloguing of the three sermons as separate imprints. They include Benjamin Wadsworth's 'Surviving Servants of God...'; Benjamin Colman's 'The Master Taken Up From the Sons of the Prophets'; and Nathanael Appleton's 'A Great Man Falleth in Israel.' NAIP says they were "Not issued separately." Church could "find no record of all three bound together, except possibly the copy in the Massachusetts Historical Society's Library." 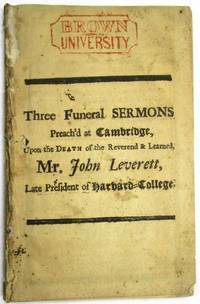 Leverett was Harvard's first secular president; he served from 1708 until his 1724 death. Church 896. NAIP w028094 . Evans 2500, 2514, 2591.